Another fantastic Essex United Tournament & Shootout! It was so great to see familiar clubs and some new ones! We look forward to providing a great tournament year over year and as we reflect on 2018, we look forward to 2019! We hope to see you again! Congratulations the winners and runners up as well as all the teams who gave it their all on the field! 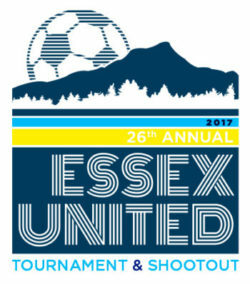 The 26th Annual Essex United Tournament & Shootout was another fantastic event. Teams from all over the Northeast converged on Essex Junction, VT just as the rain passed through and right in time for the competition to get under way. We thank and appreciate all the teams who joined us for a weekend of fantastic soccer and we look forward to seeing you again next year.